Hatsu-o Hidaka was born in Kagoshima Prefecture on 7 May 1915. He enlisted the navy and graduated from the 24th Pilot Trainee class in July 1934 to become a fighter pilot. In November 1935 he was assigned on board the Kaga. At the start of the China Incident he advanced with the unit off Shanghai. At 09:25 on 11 November, three Northrop 2ECs of the 2nd BG led by Yu C. Y. attacked the carrier Kaga off the Maanshan Islands. They didn’t hit the carrier and were intercepted by three A5Ms from Kaga. Two of them were shot down; one was claimed by PO3c Hidaka while the second was claimed by the shotai leader Jiro Chono (his first combat and first victory). Gammas no. 1405 (Sung I-Ching and Li Xi-Yong) and no. 1402 (Peng Te-Ming and Li Huan-Chieh) were both shot down. Yu managed to return to base with the third Northrop after escaping by diving into the clouds even if it also was damaged. In June 1938 he was transferred to the 15th Kokutai. On 18 July the 15th Kokutai dispatched 14 carrier bombers and five carrier attack aircraft under Lieutenant Commander Matsumoto, escorted by six A5Ms led by Lieutenant Mochifumi Nango (Class 55), to participate in the attacks on Nanchang. The carrier fighter squadron, however, was unable to rendezvous with the carrier bomber squadron at the appointed place. They clashed with a reported eleven Chinese fighters in an air battle over Lake Piyang and after finishing off a damaged enemy fighter Nango turned to search for a new opponent when another burning Chinese fighter crashed into him. Both machines tumbled into a lake. The Japanese fighters returned to claim 9 victories and two probables with only one loss. Two of the victories were claimed by PO3c Hidaka. 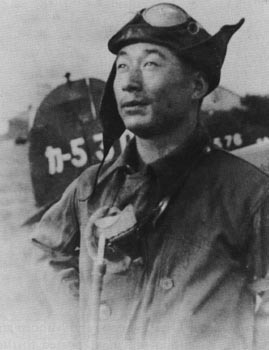 PO3c Ichiro Higashiyama, who flew as number two wingman to Nango and witnessed his demise, claimed two enemy aircraft (totally 6 victories – 6 in China). Five I-15bis from the 8th PS at Xiaogang (Hubei Province) had been sent to Nanchang for early reaction to Japanese attacks. In the air battle Lieutenant Huang Qiu was first shot down, and then the Japanese surrounded and destroyed the entire group of I-15bis. According to English sources it was the Soviet volunteer V. Dadonov, which crashed into Nango, escaping by parachute. At the same time Lieutenant (junior grade) Ogawa and Satoru Ono (who recently had been posted from the Kaga and was flying as number two wingman to Matsumoto) of the carrier bomber unit pulled off the stunt of landing on the Nanchang airfield, setting enemy aircraft on the ground afire, and then taking off! Totally 19 Chinese aircraft were claimed destroyed on the ground. Ono also claimed two additional enemy aircraft in the air. He returned to Japan the following December. Hidaka then went on to serve successively as an instructor with the Kasumigaura, Kure and Omura Kokutais. In October 1942 he was promoted to Warrant Officer and attached to Kokutai 204. Toward the end of December, he advanced to the base at Buin, in the Solomon Islands. He fought with Lieutenant Miyano but had to be hospitalised with malignant malaria and he was transferred back to Japan. when the war ended he served as an instructor at the Yatabe Kokutai. Hidaka ended the war with 2 biplane victories and a total of 11. (a) Northrop 2EC Gammas no. 1405 (Sung I-Ching and Li Xi-Yong) and no. 1402 (Peng Te-Ming and Li Huan-Chieh) of the 2nd BG shot down. (b) The 28th and 29th PS claimed at least nine victories (5 D1A1s, 3 A4Ns and 2 A5Ms) in this air combat while losing four Gladiators. The fighters from the Kaga claimed four victories while losing at least 5 aircraft, one A5M, two A4N and two D1A1. The Chinese found a total of 4 wrecks, which would account for the 3 fighters and almost certainly one of the dive-bombers. (c) Probably claimed in combat with five I-15bis from 8th PS, which lost all five aircraft. The 15th Kokutai claimed 9 victories and two probables with only one loss. Much additional information kindly provided by Raymond Cheung, Edward Chan and Tom Chan.